WinADayCasino.com has added another new slot to its unique collection of one of a kind casino games. The new slot machine Grand Liberty has two exciting bonus games to give players lots of extra free playing time. Its ‘wild west’ design and symbols like the Liberty Bell and Statue of Liberty are a tribute to America. As usual WinADay will give all players some free money to try the new game. Everyone that logs on between July 18th and 24th will find an extra $12 in their account. Players who play Grand Liberty during the launch celebrations also have a chance at winning one of thirty cash prizes with a grand prize of $750. WinADay creates all of its own games – that’s why they can’t be found at any other online casino. But they did get some help with the name for this one which was chosen through a contest on the casino’s Facebook community page. Hundreds of names were nominated but voters chose the name entered by a player known as “SHLOMIC” who won $500 for his winning suggestion. Grand Liberty is a 5 reel video slot machine with 30 pay lines featuring two exciting bonus games. Players can bet from $0.02 to $5.00 per payline and win payouts up to 1000x (for five Liberty Bells). Three White Star symbols trigger ten free spins and three Gold Star symbols start the Pick Your Bonus game. For the Bonus Game, the slot machine symbols are replaced by a grid of fifteen "Pick Me" cards. Players select cards which reveal bonuses up to 5x the bet until they find a Collect symbol which ends the bonus round. During free spins triggered by three White Stars, the wild Statue of Liberty symbol expands onto the entire reel to substitute for all other symbols on a payline. WinADayCasino.com is a no download casino with 26 one-of-a-kind online casino games - online slot machines, video poker, roulette and keno. WinADay went back to basics for its last new game, Fruitful 7s, inspired by traditional pub style fruit machines. Most of WinADay’s slots are tied to one progressive jackpot which was recently hit for nearly a quarter million dollars on the Vegas Mania slot machine. The jackpot was reset after that record-breaking win and is currently over $100,000. 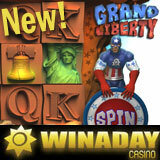 Meet other slots players on the WinADay Facebook page! If you've tried WinADay's new Grand Liberty online slot machine, please use the 'Post a Comment' box below to tell us what you thought of it!